One of the greatest marvels of life is watching how fast your baby grows. But while enjoying this beautiful phenomenon, don't forget that your tiny tot's tiny nails grow at an even faster pace. With Mee Mee's Protective Nail Clipper, you can trim those nails safely and comfortably, before your baby starts scratching. For a smooth experience, you could try trimming the nails while your baby is sleeping. Also, this nail cutter for baby is easy to use and is suitable for even newborns. 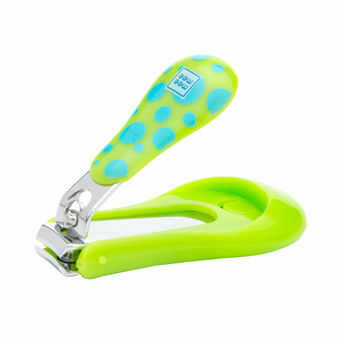 Conforming to the highest safety norms, just like other Mee Mee baby products, this baby nail cutter is easy to be cleaned both before and after usage. Use a soft and damp cloth like wet wipes for cleaning the clipper. Keep away from child's reach. During storage, fold the magnifier down and rotate handle to nest inside base.